I certainly feel my cookery strengths lay in baking, however I have a weak spot with pastry (and chocolate). I was never formally taught the skills for pastry and over the years I have learned from some rather significant errors! Very kindly, a dear friend of mine booked me onto a pastry course as a gift for a significant birthday. I was truly spoilt – thank you again J! The course was provided by the Edinburgh New Town Cookery School, which I had been keen to try out after a few recommendations. We arrived early in the morning to tea, coffee and biscuits all freshly prepared for our arrival. There were about 16 of us altogether, mostly made up of single individuals. We began the day by watching demonstrations of the different types of pastry we would be making that day: pâte sucrée, choux pastry and puff pastry. Once the demonstrations were completed we were ushered upstairs to the kitchen where we donned our aprons and took up position at our workstations. It was bliss! Whilst my pastry experience to this point did make me feel a little like I knew what I was doing, I was grateful for the gaps of my knowledge to be plugged. Technique for pâte sucrée for example, was something I would likely have never properly attempted on my own. And I know that sometimes when trying out something new I can inwardly panic if I have no previous reference for what I am doing and then likely go on to sabotage my efforts, which I can now say confidently I would have done with the choux pastry! Pre-measured ingredients were supplied for each of us with each workstation equipped with everything we might need. Our instructor coached us through each stage making us feel like professionals! We jumped around the different pastries to allow for them to chill and rest, etc. but the transitions were effortless and I never found there to be any confusions between them. With the choux pastry in the oven, and the other two pastries chilling in the fridge, we were sent across to the dining room for our lunch. Lunch was prepared by a few students from the diploma cookery course for us. We had pulled pork with rice and salad accompanied by a glass of wine of our choice. Everyone seemed please with our meal and the chance to relax a moment and enjoy a little banter. We finished up with more tea, coffee and some more baked goods before returning to the kitchen for the rest of our day. 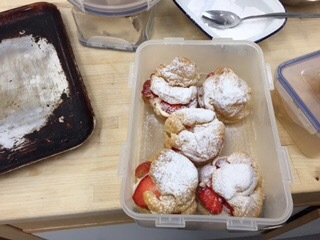 Whilst we had been enjoying ourselves over lunch, the instructor and her assistants, had been kindly baking all our choux pastry and making sure they were pulled out and pierced in the bottom to cool properly. When these cooled we worked on the filling for our pâte sucrée, raspberries and chocolate. The chocolate was melted with glucose (to prevent it setting too hard) and cream. 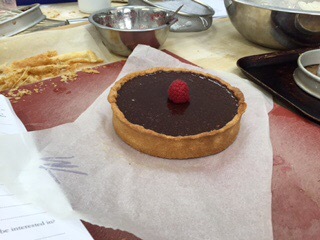 We placed the crushed raspberries into the bottom of our baked pastry cases and poured over the chocolate, being careful to prevent any bubbles. This was left to sit in the fridge and set. The puff pastry was rolled out into a thin sheet, pricked with a fork and gently tapped at the edges with the edge of our palette knife to encourage the rising of the pastry. 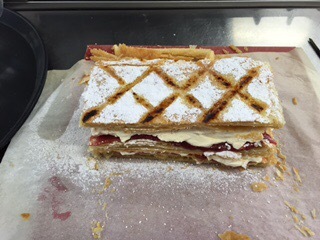 Once it was baked and cooled we trimmed the edges and cut this into three equal parts for the millefeuille. We selected the nicest looking piece for the top and set this aside. Then applied some strawberry jam to one piece and covered this with some lightly sweetened whipped cream. Added the second sheet of pastry. Applied the jam and cream again. Then put the last piece on top. Here we dusted with icing sugar and then used heated metal skewers to burn into the sugar on top in a lattice pattern. So lovely! The cooled choux buns were next. Cut in half, filled with whipped cream and sliced strawberries, and then lightly dusted with icing sugar. After this we filled our containers (we were instructed with registration to provide a few containers with us to take our baking home) and we were free to leave. Overall, I found the course was a great experience and reinforced existing knowledge whilst plugging the gaps I had to make me much more confident working with pastry. I was literally beaming as I came away from the day and immediately set about looking at all their other wonderful day courses I could sign up for next!